I have many clients and friends who come to me with questions about how they can make their horse life have less conflict, less liability, and less drama. They seek assistance in creating reliable contracts and written agreements, as well as my counsel on how to handle difficult equine situations and relationships. 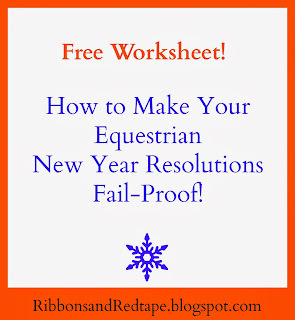 I've written this post to help you frame and realize your goals for 2014, so that your horse life can focus more on the joy of riding and less on the anxiety of legal, business, or personal conflict. Here is to a year of accountability, reflection, action, and success! Most of us at one time or another become frustrated when we don't accomplish our New Year Resolutions. We start the New Year with a fresh slate and a feeling of such great excitement of hope and possibility. Thinking of who we want to become in the next year, or how we can improve our lives is such an intoxicating dream! Envisioning where you want go with your goals is an enormous part of reaching them- without dreams we can often become stagnant- but dreams without action often remain unaccomplished. There are many ways to achieve your goals- and I'm sure your mother, friend, significant other, or trainer- are all willing to give you their two cents. While it is often wise to listen to the advice of others, taking a moment to really contemplate WHAT you want to accomplish, WHY it is important to you to accomplish the goal, and HOW exactly you will meet that goal is typically the greatest recipe for success. This FREE worksheet incorporates these important elements of goal making and goal accomplishing. This Worksheet includes a completion guide and an example worksheet for your convenience and guidance. It is a simple worksheet, but it asks the right questions. This is the key to efficiency, productivity, and success in accomplishing your resolutions this year! Ready to craft your perfect, personalized, and FREE worksheet? Take action, this worksheet will be available ONLY until January 5, 2014. No download, no gimmicks, no steps. Just Click! Do you love to learn informative and interesting horse-world issues? And do you appreciate free stuff? Please enter your e-mail address to receive valuable tips and insights about horse ownership and equine law and business to your e-mail box. I would never spam or jam your e-mail box, and you can of course unsubscribe if at any time you don't find the information helpful! Yes! I want more GREAT equestrian content! One of my New Year Resolutions is to offer the thousands of readers who visit this blog more equestrian law, business, and lifestyle content that is authentic, helpful, insightful, educational, and interesting. This blog initially began to serve my own educational needs, and this year I want to focus on my mission, making this blog more about YOU: savvy equestrian readers who love to learn, who appreciate reliable equine resources, and who love horses and want to improve their equine lifestyle. With that in mind, keep an eye out for some upcoming exciting changes right here at Ribbons and Red Tape. Thank you to my readers for making "this whole blogging thing" worth it! Care to share? Let us know what equine goals you have, or if you have any tips to getting those goals met in 2014. Did you write a post on the topic? If so, leave the specific link in the comments! Want to stay up to date on important equine legal issues, like horse slaughter, wild horses, equine contract horror stories, important equine law litigation, business law for equine business owners, and more?